The smaller of my (so far) two homemade tablets uses a seven inch LCD screen. The larger homemade tablet uses a nine inch screen. The problem with the larger screen is battery power consumption. It forces me to use C cell NiMH batteries instead of the AA cell NiMH batteries that fit nicely into the smaller case. The seven inch screen works well with the Pi2, and I get about 5.5 hours of “AA” battery run time with it. But, its tinyness is right on the edge of what is comfortable for my 60 year old eyes. So I thought that maybe a screen about half way between the previous two sizes could be a good compromise (eight inches). 360 mA at 14VDC (measured on battery). The battery current is less than the current into the actual LCD and the SBC board because the voltage on the input of the DC-DC converter is higher than what is fed to the boards. (Input = 14V battery, output = 5VDC). We are disregarding the converter inefficiency, because it’s small (at least mine is). Because the ratio is almost 3 to 1 (battery voltage to output voltage ratio), the rough multiplier is about 3 to 1, disregarding any converter inefficiency. So, 125×3 is close the the 360 mA the SBC board actually draws, etc. The total output current on the converter is something like one amp ((14V/5V) * 360 mA). The 360 mA total battery current figure is real nice, because it allows the batteries to run a long time, even though they’re AA NiMH cells. With a super-duper charge on them, I get over six hours of run time! So, what happens when I upgrade to an eight inch screen? I = P/V = 7W/12V = 580 mA. 580 mA + 125 mA = 705 mA battery current, which is not quite double the original current, but it would wack my ideas about using the AA bats in the smaller tablet. Why so much difference? Ok, so that last diagonal inch (the way they spec monitors) adds a bunch. The resolution difference means we’re comparing apples and oranges to some extent, because the seven inch screen is disproportionately smaller than the new eight inch screen due to its lower vertical resolution. The eight inch screen gives me almost double the square inch viewing area! Double the screen area, double the power consumption. Makes sense. So, the diagonal “inch” numbers on a screen don’t scale well to our perception. Recently, I set the ADC in one of the tablets to monitor per-cell voltages as a function of time, and found some interesting results. The tablet was one of my larger ones, with a bigger screen (ten inch) and higher power consumption. With a set of NiMH batteries giving a run-time of about five hours, I discovered a “horse shoes/hand grenades” rule of thumb for similar situations (with approximately the same power, current, voltage variables). The pack started off (after a full charge) – at about 1.36 volts per cell under load. This dropped to below 1.3 volts in about twenty minutes. The fall to the 1.2 VDC level happened at a rate of about 750 microvolts per minute. There was a slightly non linear decline in voltage (voltage trending downwards, rate of change accelerating upwards) for most of the run-time period. 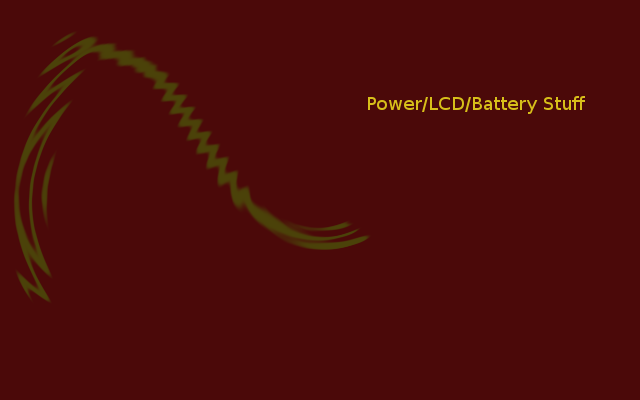 The non linearity was so slight in the center majority of the battery discharge curve as to warrant calling it “flat.” At the 1.16 VDC level, the rate of decline was observed to be about 1.5 millivolts per minute, and the curve was becoming a real “curve”. I stopped the discharge at the 1.1 VDC level, which was definitely past the “flat top” portion of the NiMH curve. Sixty percent of the total run-time was with the voltage at or above 1.2 volts. Twenty eight percent of the runtime was with the voltage between 1.2 VDC and 1.16 VDC. Twelve percent of the run-time was with the voltage between 1.16 VDC and 1.1 VDC, at which point I stopped, and turned the computer off. I suppose I could have had a little more up-time had I kept going, but I’ve read that NiMH batteries last longer (lifetime, not run-time) when not discharged fully. In fact, a full discharge often ruins them. The decline at the end of the discharge cycle accelerates for multiple reasons. For one thing, as the voltage declines on the battery pack, the DC-DC converter changes the loading in order to pull the same amount of power (which increases the current through the batteries, which are less efficient at the higher currents). So, the end of the cycle experiences a synergistic boost to the discharge. I am using Imedion “C” cells in the homemade tablet. I consider them to be very good (made in Taiwan), although most japanese batteries can hold their ground as well. Some people like Exynos. I started using Imedion and never looked back. Figure 1: My NiMH data, with a few jitter points from the ADC. In figure 1 the NiMH discharge curve derived from my ADC data is displayed. There are a few jitter points to be seen, and I didn’t spend a lot of time calibrating the readings either. Therefore some inaccuracy may be present in the vertical voltage scale. Mostly what I am showing is the general feature of the curve, with a “more linear” section in the middle, where most of the discharge occurs. These Imedions may have a slightly different set of characteristics than other Imedions or other NiMH batteries. This is a five hour discharge curve.